Going Dark follows Amelia as she tries to help journalists that have been kidnapped which has sparked an international incident. What was the inspiration for the setup to this thrilling novel? The idea of ‘Going Dark’ started to form in my mind as I spent nights working on the foreign desk at CBS. Those nights, I was alone in the entire studio, watching incoming video feed from our military forces stationed in Iraq. In 2006-07, the war was in full swing and we received daily updates on the progress and struggle people were facing during the war. The war zone wasn’t too far off from our foreign correspondent team stationed in Iraq, reporting from there. As I was sitting at my desk, I envisioned Amelia Sinclair (a foreign liaison in Going Dark) how hard and challenging must be to be separated from your family when your job takes you away from them, especially if you have young children. Amelia and Jets are dynamic characters that are enigmatic and empathetic. What were some themes you wanted to capture in their characters? Amelia had to sacrifice her career when she became a mother. Having children was not something she had planned on doing, but when it happened, she made the decision to stay back and take a desk job. However, her thirst for adventure never fully went away. So, when her boss, Harold Fost, approached her with a proposition to oversee a covert assignment, she simply couldn’t resist. But Murphy’s Law tipped the scale against her and her friends and co-workers get kidnapped. I wanted ordinary people, the readers, who juggle work and family life to be able to relate to her and to the choices she makes along the way on this journey. Jets is a complicated guy. He’d seen things most of us have not, working as a spy for the CIA. To me, he was interesting because, he believed in the cause set forth by the CIA, but he still had conscious and when he sees the wrong person is being blamed for crimes that she didn’t commit; he has to put aside his oath to the CIA and go with his guts, even if that decision could cost him his career. This is an exciting novel on par with Robert Ludlum or Tom Clancy novels. Did you start writing with this in mind of did this happen organically? Tom Clancy was a master at setting up an engaging plot and building action in his novels. He is certainly an influencer in my writing. Another writer whom I admire is John Le Carre, unquestionably the undisputed father of spy thrillers. Both of these writers are exceptional. I recently finished writing the second book in the Gabriel Jets series, called Political Whispers. Jets is a castaway in Afghanistan, having accepted a covert position, offered to him by Robert McKaine. Jets is in charge of a secretive drone program, most on Capitol Hill don’t know it even exists. The second book has more military overture and is action packed. Political Whispers is slated for release in early 2019. Gabriel Jets is the CIA’s top agent, a man with a reputation of getting the job done, no matter the price. On a rare visit back to the States, Jets is dispatched to collect a video depicting the kidnapping of four U.S. journalists working undercover in Damascus, Syria. Meanwhile, the U.S. president and his chief of staff, Robert McKaine, are called to the Situation Room to receive a briefing. Damascus is rocked by a terrorist plot that killed twenty-five innocent people. A link between the two events is quickly discovered, with evidence pointing to the involvement of another U.S. journalist, Amelia Sinclair, a prominent foreign correspondent, with direct ties to the missing. While Jets hunts for the video, he crosses paths with Amelia. In a blink of an eye, his mission is compromised as he believes she is being set up to be the fall guy. As the U.S. government closes in to arrest Sinclair, Jets alters his assignment to help clear her name and track down the powerful men behind the ploy to draw in the country into an international scandal. If Jets fails, the country he swore to protect, will go dark. 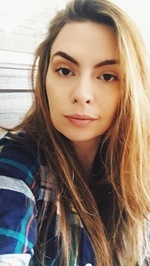 Amelia Sinclair, a foreign correspondent liaison for CWG news network, had worked on the bottom floor of the UN in a renovated steam-room for the last four years. Upon receiving a suspicious email with the subject line as her name written in Farsi, she opened the link embedded within to see a horrifying video. Fellow journalists, whom she knew personally, confronted with masked assailants. Going Dark follows Amelia as she tries to help her fellow journalists, one of which, whom she was very close to. Simultaneously, the beginnings of a media frenzy are in the works as the government tries to prevent a leak of the video. To add to the chaos, a bomb detonates in Damascus, just outside of the hotel where the journalists had been staying before they were kidnapped. With 25 pronounced dead in Damascus, 4 American journalists kidnapped, and a seemingly related murder of a man on the streets of Brooklyn, everyone is on high-alert. The author, Jolene Grace, gives two distinct perspectives throughout the novel. The first is the journey of Amelia Sinclair, from the UN basement level media department to a loft in Brooklyn. The reporter finds herself hurried along by her superiors as she tries her best to protect her fellow journalists who are held captive; whilst she herself is considered to be a suspect in their detainment. The second perspective is from the inside of The White House, where the President is working on how to spin the situation to his advantage to gain a second term, whilst others are trying to hurry the CIA to gather intelligence. Equally, discussions are being had as to who to bribe and who can be trusted. This gives the novel a lot of freedom to explore espionage on multiple levels. An example of these two perspectives working together is when a sniper takes aim at Amelia Sinclair; Agent Jets is nearby and tries to help, whereas from inside the white house he has dropped off the radar. 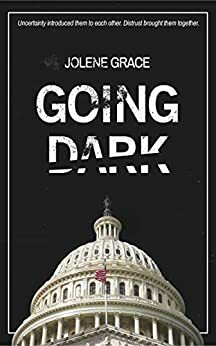 Going Dark is full of tension, built up by a switching of perspectives at crucial moments, allowing the reader to hear both sides of the story. As the government tries to keep a lid on the story that numerous media outlets are trying to expose to the public, the reporter Amelia Sinclair tries to save her fellow reporters whilst being hunted down. The reader, the characters and at times Amelia herself, question why she received the video in the first place. However, we also get the sense that she knows more than she is letting on. Among the possibility that there’s a government mole, leaked CIA safe-house locations, government tracking and a sniper on one’s doorstep, it’s hard to know who is the ‘good guy’ and who to trust. Through it all there is a real sense of connection with the characters. For instance, Amelia is plunged into a situation where everything seems out of control. Sitting in a Philadelphia CIA stash-house and all she wants to do is call home to her daughter, Ava, and make sure she’s safe. Jolene Grace creates so much tension in the book as none of the characters know, or at least don’t seem to know, the full story of what is going on. The author develops the characters superbly, and a real sense of empathy is created. But there is a fragility in knowing them as it’s hard to tell if they will live to see the next chapter or not. Everyone is at risk and everyone is on high-alert. Masks follows Anna as she struggles to find herself and her love as she navigates the social, religious, and sexual taboos of the Arab world. Why was this an important book for you to write? It had always been my dream to write novels, and I wanted to start my first book by being the voice of so many in the Lebanese and Arab society who pay the price of the social, religious and sexual taboos and never dare to speak up for themselves. If you had the chance to let the rest of the world read and find out about certain issues that people suffered from wouldn’t you write about them? Masks is based on true life events. What were some things you felt had to remain true in the story and what were some things you took liberties with? Though Masks is inspired by true life events yet it contains fiction, the part of the story that had to remain true is my own feelings and thoughts, this is a very hard question… well, I took liberty in writing about some facts but created characters that were the combination of more than one person in real life. I understand that the story is based on your own life. Was there anything that was difficult for you to write about? I already started writing my second book hoping it will be available within two years, it is somehow the continuation of Masks, though the first book has an end, the second book will talk about different adventures and taboos. Some characters from my first book will be in the second story but the readers will meet new characters with different problems and dissentious personalities. I thank Thomas Anderson for this short yet interesting interview, the questions were few but very well chosen to satisfy the curiosity of any reader about the novel. I wish you a very prosperous career, I appreciate your time & work & hope to bring a change to my readers with the story of Masks. Masks is a dark fictional tale, based on true-life events. It narrates the adventures of a young Armenian girl born in Lebanon in the seventies. She dreams of fame and power in Lebanon and the Arab world and shows resilience and motivation beyond her years. The novel delves into the world of the protagonist, Anna, who is surrounded by social, religious, and sexual taboos. She fiercely breaks the chains to enter the world she has strived to reach, in a seemingly conservative society barely emerging from a civil war. She builds her success on her remaining values, challenging her fate and sparing no way means to attain her goals. As a disappointment to her parents, she walks the challenging paths alone, making her way toward fame and fortune despite lacking the support system to do so. Doors begin to open for her, and she enters the world of Arab celebrities. She is now a public figure in the Middle East, living an immoral married life in a materialistic world surrounded by influential business people and royal family members. She tries, in vain, to fill the void in her soul with sexual adventures and controversy by taking a wide variety of lovers. Her adventures invariably end in misery, doing nothing to awaken her from her numbness. Still, her vivid, out-of-control personality helps her move forward while simultaneously getting her in trouble. In the early stages of her life, she has suffered the unthinkable, being bullied and raped, with the civil war a constant backdrop throughout most of her childhood. The novel delves deep into Anna’s mind as she has flashbacks of the trauma she has suffered, offering the reader a hint of an explanation for her behavior. In a society in which men dominate women, she is one of the few who realize that fashion, social status, plastic surgeries, and bright smiles are not the answer to happiness. She lives in a world where a girl is only worth as much as her virginity, where women do not dare to ask for a divorce, where the fear of retribution keeps them locked in a cage that is very rarely gilded. 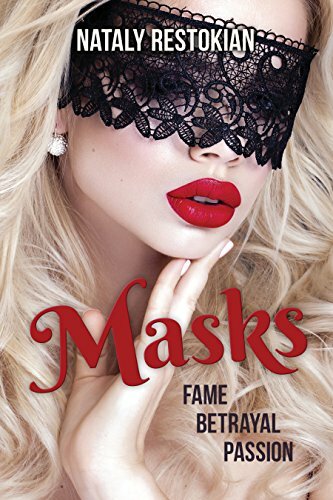 As fame, money, and power slowly eat at her soul, the arrogant Anna falls in love with a total stranger—a young, single bachelor from Canada—after a night of secret passion. That is where the story begins to unravel as she returns home with a scandal in her back pocket, her eyes and ears and heart tuned to this man instead of her husband. Anna realizes that neither her marriage nor her achievements have ever made her happy, so she decides to throw it all away. The lies and deceit that fill the so-called glamorous life she has been leading are floating up to the surface, including her husband’s infidelity and the critical steps she has taken to reach the top. Marriage, family, career—all destroyed to be united with the stranger. She starts a new battle, this time struggling to change her destiny for someone she barely knows, who lives oceans apart and offers her nothing except his heart. She risks everything, turning her whole life upside down. Anna realizes that her happiness, inner peace, and love are found worlds away from her own, with someone she would never have expected to be her soul mate. Still, Anna’s sacrifices are not behind her, and the struggle has not yet ended, although she has found what she has needed all her life: redemption and unconditional love. The stranger enigmatically hints at emotions in Anna that have been hidden for a long time behind the masks of her dark and shallow lifestyle. The characters in the story are the voices of so many who do not dare to speak up in a world where social and religious standards openly chastise the very actions that behind closed doors have become the ultimate paradigmatic way of life. 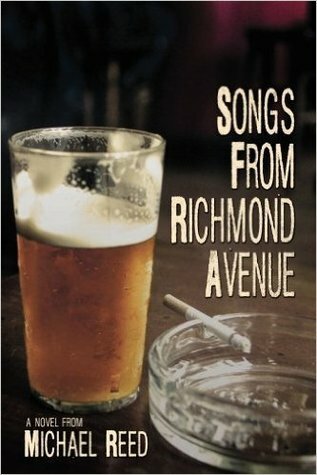 Songs from Richmond Avenue is a novel about characters that could be found in any town. The main character is a journalist that knows all the questionable characters that hang out on Richmond Avenue in Houston. Why was this an important book for you to write? I felt like it was important that if I was going to write a book at some point in my life, I get on with it. Since the age of about 20 years old, back when I was a journalism student, I had always just assumed I’d get around to writing a book. I guess the older I got the more not writing a book bothered me. Fortunately, a few years ago, I became unemployed for about eight months. I say fortunately because that’s when the book started taking shape. I was drawing unemployment after a publication I worked for went belly up. I looked for work online in the morning and when that got boring, which happened pretty quickly most days, I started writing a couple of short stories based loosely on some funny things I’d witnessed riding metro buses or walking through my neighborhood. One morning I stuck a couple of these short stories together and decided to have them come from the voice of a single, first-person narrator. Then I decided to have the narrator go to a bar. That is the essence of the book. While it didn’t take a long time to actually write, there was fairly long span of time between when I started and completed it, because I set it aside when I got another job. Maybe there’s a lesson in that, but I hope not. That’s a tough one since I really didn’t approach Songs From Richmond Avenue with any thoughts of trying to espouse any particular point of view. This isn’t really a moralizing kind of book that takes sides among its characters or proclaims one vantage point in a conflict is right and the other one is wrong. I think the moral perspective might be not to be judgmental of others. There are no heroes or villains in the book, just people with strengths and weaknesses having good and bad moments. I think the book may share its basic moral underpinning with film noir. These characters live by their own loose moral codes and the protagonist, despite his many trials and close calls, doesn’t come away having learned much of anything from his ordeal. How did you decide on the title of this novel? Initially, I thought the book would be more a series of individual character vignettes, loosely held together by the fact that they all frequented a fictional dive bar called the Relix Club on Houston’s Richmond Avenue. There was originally going to be more of a secondary plot involving a down-and-out musician who occasionally hung out at the bar. There were also bands and singers who appeared there, so I came up with Songs From Richmond Avenue, using “song” as a metaphor for each of the character’s lives. When I changed courses a bit, the book remained Songs From Richmond Avenue, primarily because I liked how it sounded and couldn’t come up with anything better. It’s a book that, hopefully, will be available in about year. This will be largely dependent upon whether I write a little more frequently once baseball season is over. I’m about halfway through a story that bears some similarities to Songs From Richmond Avenue – hapless characters, drunken debauchery, bad company, worse decisions. The setting will be far less urban, but what isn’t less urban than Houston? There won’t be a first-person narration this time either. It’s had a couple of working titles, both of which are terrible, so I won’t mention them. If the adage “nothing civilized ever resulted from the drinking of beer” requires further proof, one needs look no farther than down Houston’s pothole-infested Richmond Avenue. There, the blurry-eyed denizens of the Relix Club wile away the hours engaged in their two favorite activities – drinking and betting. Mostly satire, often wildly unpredictable, the only real long shot in Songs From Richmond Avenue would be for its protagonist to put down his beer long enough to learn anything of true value. Songs from Richmond Avenue by Michael Reed is a dark novel about characters that could be found in any town. The main character is a journalist that seems to know all the questionable characters that hang out on Richmond Avenue in Houston. He meets a beautiful woman named Michelle that he becomes infatuated with from the start. Michelle could change things for the journalist, but not before he gets caught up in some seriously crazy shenanigans that include kidnapping, booze and roommates. Among everything else, you get to know some barflies who have very interesting stories and a love for alcohol and bets. This story isn’t long, but packs quite a bit into such a small package. I can imagine this story set in any small local dive bar. There would be those regulars that have extremely colorful stories that are darkly humorous. The writing is unique and paints a descriptive image of all the characters in the book. Each one has personality and detail that many authors gloss over. His descriptions made it easy to visualize and even smell each and every one. “Songs from Richmond Avenue” could almost be called a drunks love story, as the journalist finds himself wishing for a future with Michelle. He may not exactly be a romantic character, it’s love just the same. Throw in some depressing thoughts while mixing in some humorous parts and that sums up this story. It took me some time to really get into the story. Michael Reed has a unique way of developing his characters that takes a bit of adjusting to. Once I got farther into the story and got use to the craziness, I was in for the long haul and wasn’t bothered in the slightest. This is definitely not a light and airy read, but I think that is part of the appeal. I had to read slower than I usually would have with any other book which made me connect with the locations and situations. I honestly don’t want to tell you too much, so that you can have the same experience as I did. The antics that take place are so off the wall I wouldn’t want to ruin the fun for the next reader! While it did pick up later, it was a bit hard to get into at first. Many readers I know would put down a book they weren’t drawn into from the beginning. While I know that a slow beginning doesn’t mean anything, that doesn’t make you not feel a bit frustrated. I would suggest anyone who enjoys dark humor and crazy drunken stories to give this book a shot.